Han Haun tried not only to become self-reliant but also to realize their 'human life'. 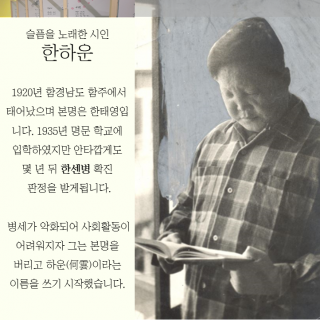 He established the ‘Shinmyung Nursery School’, a welfare facility for the second generation of lepers and made endless efforts to allow lepers to enter the public education fence. We interviewed the director of Shinmyung Nursery School to see the awareness of Shinmyung Nursery students on Han Haun. "Unfortunately, the children who live here now know little about Han Haun." So, what is the way to develop Bupyeong related to Han Haun? Why not set ‘Road of Haun’ at Sipjeong-dong, Bupyeong-gu, where he had lived? By appointing it, people would be able to feel his human and literary historical value. It is also could be the way of remembering that we hold contest about his works celebrating ‘the Day of lapers.’ Hanhaun said "I have come back to my hometown, but I cannot go back to my house. I cannot go back in the day because of the fear of the people, so I waited for the night to come".